exciting series of ten books set in outer space (for children ages 6-10). Ever wondered if aliens exist? What if one needed your help? Would you travel to outer space? of their innocence? And how will they manage to collect the flying shoes, escape Mercury and continue their quest to save Uglesnoo’s sister? When is a present not a present? When it’s a friendly purple alien called Uglesnoo, from the planet Pluto! Uglesnoo needs to leave right away for the Moon. Uglesnoo also desperately needs Amelia’s help. Should Amelia venture into outer Space? Read this book and over 1 million other books with Kindle Unlimited. Uglesnoo needs Amelia’s help. His sister is very sick. The only cure is a repelling crystal from Neptune. With his Earthling friend, Amelia, they must continue their quest. More items are needed to buy the crystal. But Venus is full of danger and angry aliens. Are Uglesnoo and Amelia in over their heads? Name: Neptune is named after the Roman God of the oceans, lakes and rivers. Poseidon is the Greek equivalent. Neptune the God is often shown carrying a trident and riding sea horses. In 1612 , the famous astronomer and scientist Galileo spotted the planet Neptune, whilst looking at the night sky, but mistook it for a star. So Neptune had to wait until 1846, when it was officially discovered by both Urbain Le Verrier, (French) and Johann Galle, (German). Fun Neptune Facts: In keeping with tradition they decided to name the planet after a Roman God. The planet being blue, how do you think they chose its name? Of course, it had to be Neptune, the Roman God of the seas! Do you know where’s the coldest place in the entire Solar System? If you’re guessing Neptune right now, you’re getting warmer (or should I say colder?). Actually the chilliest place in our Solar System is on Triton; one of Neptune’s eight moons. On Triton, the temperature is a bone shivering, bitter cold of -393°F (-263.1°C) ! And you thought the North Pole was freezing! Neptune’s composition is similar to Uranus. It’s mainly made up of hydrogen and helium. Scientists think it also has an icy core of water, methane and ammonia. It’s rich blue color comes from methane in Neptune’s atmosphere. You need to use a telescope to see Neptune. And even then it can be hard to spot. The best time to look for Neptune is in the month of August. In the summer of 1989, NASA’s Voyager 2 spacecraft took the first close ups of the planet. You can see one of the images above. Pluto is usually the furthest planet away in the Solar System. But Pluto has a strange orbit, so occasionally it’s closer to the sun than Neptune. Then Neptune becomes the furthest planet away and for up to twenty years at a time! Next post: Fun facts about the dwarf planet Pluto. Evonne Blanchard is the author of, Amelia, the Moochins and the Sapphire Palace, ‘Amelia, the Venutons and the Golden Cage and Amelia, the Merballs and the Emerald Cannon. These are the first three books in Amelia’s Amazing Space Adventures. The author is currently working on the fourth book in the series, Amelia, the Snapperjacks and the Molten Maze. Curious about the series? Find out more! Ever wondered if aliens exist? What if one needed your help? Would you travel into outer space? For the adventures…of a lifetime! Amelia and Uglesnoo land on Mercury. They meet the Merballs, the friendly aliens that live there. All goes well until an asteroid hits their planet. Amelia and Uglesnoo find themselves in deep trouble. How will they convince the Merballs of their innocence? And how will they manage to collect the flying shoes, escape Mercury and continue their quest to save Uglesnoo’s sister? Name: Uranus was discovered by the British astronomer William Herschel in 1871. At the time King George III was on the throne in England. The astronomer wanted to name the planet George, in honor of his king. This idea proved unpopular with astronomers from other countries. Instead they decided to call it after the ancient Greek God of the Sky, Ouranos, (Uranus is another spelling of the same name). 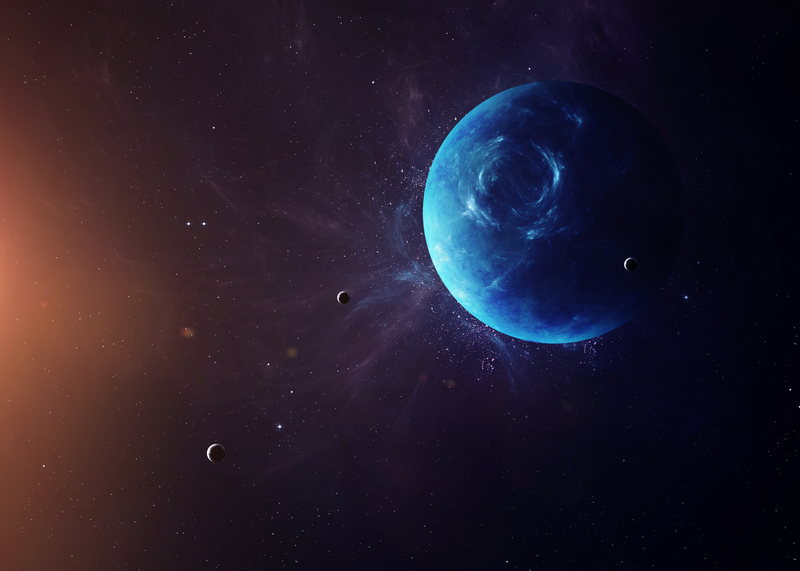 It is the only planet named after a Greek, rather than a Roman God. Fun Uranus Facts: What’s one weird thing about Uranus? It’s the only planet to spin on its side! 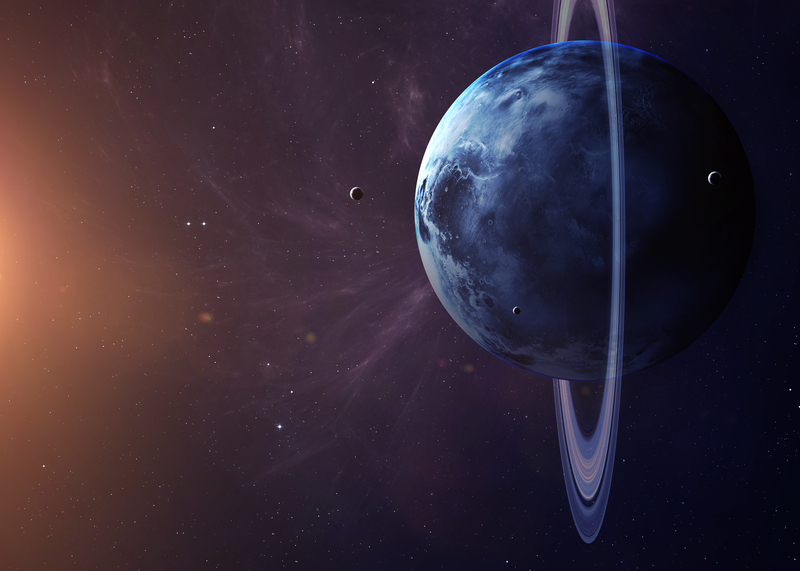 Most planets are like a spinning top when pressed down. That’s how they rotate. But imagine tipping that top over and spinning its middle. That’s how Uranus rolls! Uranus is another gas planet. Hydrogen and helium are the main gases. Scientists believe it has an icy-rather than rocky core-made up of water, methane and ammonia. You have to use a telescope to see Uranus. When you look at it, you’ll see it has a blue –green light. Sunlight reflects from Uranus’s clouds, which lie beneath a layer of methane gas. This gives Uranus its distinctive color. And then there’s Uranus’s funny name. The only planet that makes school children giggle the world over. However-according to NASA-it’s actually pronounced YOOR-un-us. At least that’s the only way they say it…without blushing! Next post: Fun facts about the planet Neptune. Evonne Blanchard is the author of, Amelia, the Moochins and the Sapphire Palace, Amelia, the Venutons and the Golden Cage and Amelia, the Merballs and the Emerald Cannon. These are the first three books in Amelia’s Amazing Space Adventures. The author is currently working on the fourth book in the series, Amelia, the Snapperjacks and the Molten Maze. The Planet Jupiter: Can you take the Red Eye there? Name: Jupiter is named after the mighty Roman ruler of all the Gods. Zeus is the Greek equivalent. 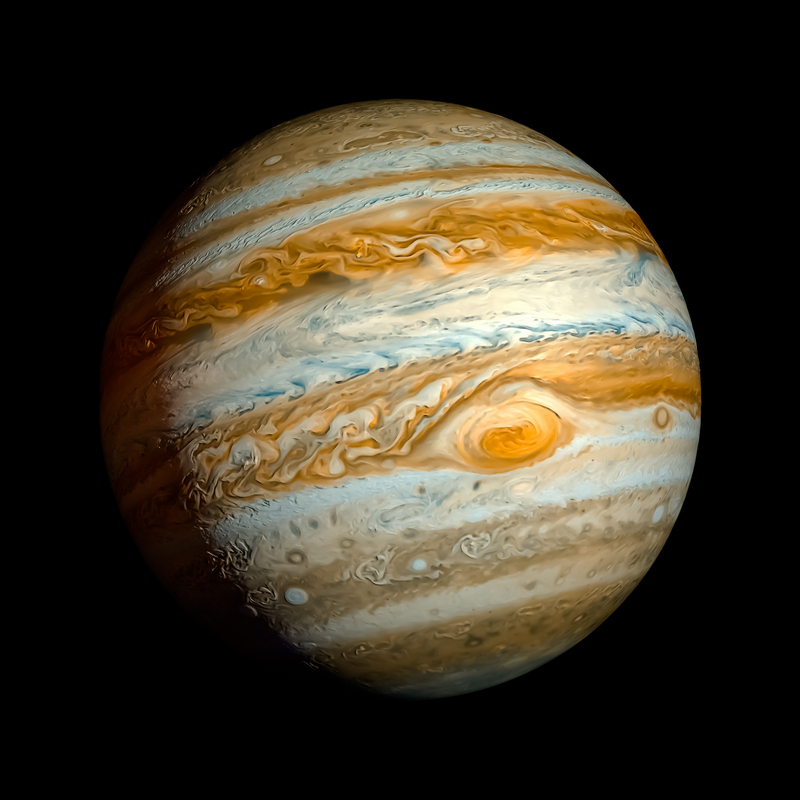 It turned out to be a great name, as Jupiter is the biggest planet of them all! Fun Jupiter Facts: Have you heard of a, ‘Red Eye? It’s used to describe a plane flight that takes off after 9pm. It’s also an expression associated with Jupiter which has its’ own red eye. Jupiter’s eye is 25,000 miles long! And even though it may look like an eye, it’s actually a storm. And an epic storm at that, it’s been continuing for over 150 years! But we can’t yet visit Jupiter on a red eye to view its’ red eye. The technology is beyond us at the moment. But you can see it in the photograph above. Does it remind you of Sauron in Lord of the Rings? A huge creepy eye, watching over us all? Scientists believe that Jupiter has a rocky core, but most of this planet is made up of gas. Layers and layers of gas. Most of it is hydrogen, then a much smaller amount of helium and a little bit of ammonia, sulfur, methane and water vapor. Jupiter has the most moons of any planet. There are sixty three and scientists are still counting. Europa is one of its many moons and is very intriguing, because it has water. Where there is water, there might also be signs of alien life. Next post: Fun facts about the planet Saturn.